The consortium ‘Groupe des partenaires pour la mobilité des Montréalais’ (Groupe PMM) has made public the design of the new rolling stock for Montréal. The Alstom-led consortium will deliver the new Réseau express métropolitain (REM) train to the city. The public was able to choose the train’s external livery, which is reminiscent of the Champlain Bridge. The headlights in particular pick up on the bridge’s support structure. Furthermore, the train’s external colour scheme, green and white, picks up on Montréal’s green spaces. And in order to allow passengers to enjoy the outside space while travelling on these new trains, the design features panoramic windows as well as large bay windows at the ends of the train. In total, Alstom will deliver 106 two-car Metropolis trainsets, equalling 212 cars. This light metro system will be fully automatic. Alstom has sold in excess of 850 driverless metros worldwide to date. The Metropolis for Montréal focuses on passenger comfort. The doors will be wide, with a spacious internal design to ease passenger flow. 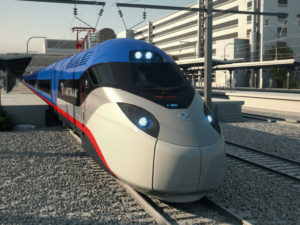 Alstom’s design also ensures that noise and vibration levels are kept to a minimum. Lastly, passengers will benefit from real-time information displays. The consortium won the contract in the beginning of 2018. It is Quebec’s largest transit project since the opening of Montréal’s metro in 1966. Once the REM is complete, it will run for 67km with 26 stations. The line will connect downtown Montréal with the South Shore, the North Shore, the West Island and Pierre Elliot Trudeau International Airport. The project involves the conversion of commuter rail lines to rapid transit lines. In total, the REM will consist of four branches. They will terminate at the airport, at Deux-Montagnes, at Sainte-Anne-de-Bellevue and at Rive-Sud. Three stations in downtown Montréal will connect the REM to the city’s existing metro lines.